The greyhound arrived in Europe more than 3,500 years ago. In 1014, King Canute of England enacted the Forest Laws, which stated that only noblemen could own and hunt with greyhounds. In the 1500s, Queen Elizabeth I abolished this law and later initiated the first formal rules of greyhound coursing. Thus, greyhound racing became known as the "Sport of Queens." In the early 1900s, huge crowds would gather to watch greyhound coursing. In the interest of safety, enclosed courses were introduced. These enclosed courses were much smaller than the open courses and speed over agility was of utmost importance. It was just a matter of time before racing would take over from the well established coursing. 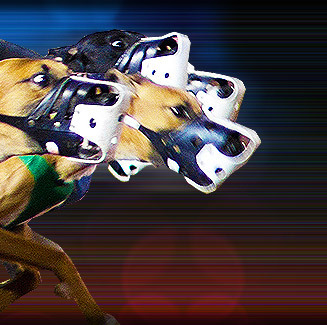 On July 24, 1926, in front of 1,700 spectators, seven Greyhounds leapt out of the traps at Belle Vue Greyhound Stadium and raced to catch an electric hare. This marked the first ever modern greyhound race in England. Soon after, greyhound tracks sprung up all over the United Kingdom and greyhound racing was firmly established in the sporting scene. The following is a list of greyhound racing stadiums in England.